Have you been wondering what the difference between laminated and 3-tab shingles is? Or maybe you’ve head that they’re essentially the same thing, but laminated shingles are more expensive? If so, why should you get laminated shingles? The fact is that while traditional 3-tab shingles and laminated shingles are similar, there are a few key differences between them that make laminated shingles extra expense worth it. And did you know that laminated shingles are cheaper than natural shingles such as cedar and slate, but can mimic them almost perfectly? Learn more in our blog. Why should you consider laminated shingles for your new roof? What’s the difference between 3-tab and laminated shingles? If you’ve ever seen a roof with those uniform, gray shingles, you’ve seen 3-tab shingles. These are the most popular shingles around due to their affordability, so odds are you’ve seen them. Laminated shingles are similar to 3-tab shingles in that they’re made of the same materials. Laminated shingles use a fiberglass base along with layers of asphalt, topped with granules. The difference is that laminated shingles have more layers and are cut differently than 3-tab shingles. So what difference do these added layers and different cuts make? 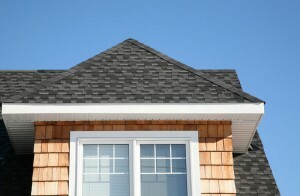 The added layers of asphalt and fiberglass give laminated shingles added durability and longevity over 3-tab shingles. Laminated shingles are more resistant to wind and rain, last longer, and have better warranties than 3-tab shingles. 3-tab shingles do the job, but they tend to look fairly standard. Laminated shingles are cut differently, which gives them a more unique aesthetic and gives them the appearance of having more depth than a standard 3-tab roof. In addition, many manufacturers offer laminated shingles that mimic natural shingle materials like slate or wood. The great thing about these is that they’re more affordable than their natural counterparts, and they don’t have some of the problems that these natural shingles do. Slate, for example, is very heavy, and usually requires installation of additional roof supports. But laminated shingles that imitate slate are lighter than slate, and so don’t require these supports. Between their enhanced durability and visual appeal, laminated shingles offer a great overall value to homeowners looking to get a new roof. This entry was posted on Thursday, May 14th, 2015	at 5:40 pm	. You can follow any responses to this entry through the RSS 2.0	feed. Both comments and pings are currently closed.